Will you take up a banner and march to war? Days of Wonder pulled out all the stops with this fantasy medieval game using Richard Borg’s Command & Colors system, but then passed the banner to Fantasy Flight Games, who have done very little with it since (possibly due to production costs and the game’s light-hearted tone). There are plenty of existing expansions to enjoy however, and the game still has the fun fantasy feel that DOW established. I was so impressed with this game when it was released I created a fansite for it: BattleLoreMaster.com: check it out for much more, though it’s now no longer updated. Be sure to read the adventures of The Raven, a character I created for the site, one of whose stories eventually appeared on the back of one of the game supplement boxes. I was trudging along the muddy verge of an ancient highway, heading south back to the land of my birth, when I first heard the distant rhythm. I immediately stopped and hid myself among the bracken that lined the muddy ditch to the side of the road. I had not long to wait. The clanking of metal upon metal became louder, accompanied by the martial rhythm of hundreds of feet marching in time. And then, around a bend in the road, the vanguard of the invading army appeared. Knights caparisoned for war, their bright banners flapping violently in the fitful breeze, the horses snorting clouds of vapour in the still-cold air of the morning. Behind the knights came the main force of men drawn up in disciplined rows, their short swords banging against their thighs, the companies identified by banner bearers who held the symbols of the army aloft. Then, the mercenaries, groups of grubby goblins in stained bronze armour, and behind them goblins mounted on restless scaly beasts that sniffed the air as they rode by, and made me retreat further back into the bracken. if you enjoy the mighty clash of armies, strategic decisions in the heat of battle, and the manipulation of powerful magics, then BattleLore is the game system for you! 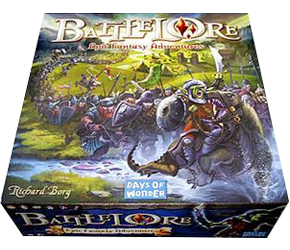 BattleLore is a game system of medieval battles that was originally released by Days of Wonder (DOW) back in 2006. Since then the game has had nine expansions, and in 2008 found a new home at Fantasy Flight Games (FFG), who after releasing a few more expansions, unfortunately seems to have put further development on hold. BattleLore uses an easy-to-play wargame system called Commands & Colors, invented by the game designer Richard Borg. This system first appeared in an American Civil War-themed Avalon Hill game called Battle Cry in 2000, then the hugely successful DOW game series Memoir ’44 in 2004, and the Command & Colors: Ancients series by GMT Games in 2006. All of these games share core elements—a deck of Command cards, a board divided into large hexes, and a set of battle dice with symbols on them. With the exception of C&C:Ancients, which uses blocks, the games use plastic miniatures (usually arranged in units of three or four figures) to represent the armies on the board. In BattleLore, these units are identified by coloured plastic banners. So how do you play? 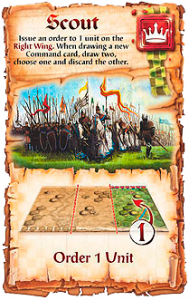 Every game requires a scenario, or Adventure as they’re called in BattleLore, which gives you instructions about which figures to set up on the table, which terrain elements to put on the board to make the battlefield unique, the victory conditions, any special rules, and how many Command cards each Commander (player) receives. The Command cards are what drives the game. Each turn you choose a Command card from your hand, and this card tells you which of your forces you can ‘activate’—move and attack—in your turn. Most are Section cards, which allow you to activate a certain number of units on either the left, centre or right flanks of the battlefield. Other cards are Tactics cards, which let you make special activations, such as charging your cavalry into the fray, or firing twice with your archers, or counter-attacking an opponent’s Command card. You move your units, and then, if you wish, can attack with ranged weapons or in melee combat. Various weapons have different ranges and strengths, but basically you roll a number of Command dice, and depending on the symbols, do damage, and/or cause the target units to flee. Coloured helmet symbols matching the banner colour of the target unit are usually a hit; a bonus strike symbol can be a hit depending on the weapon used; a flag symbol can cause the target unit to flee one or more hexes; and a Lore symbol can be used to activate Lore cards, which have magic and other special effects. Lore cards bring a unique element to the game of BattleLore. If both players agree, at the start of the game you can set up a War Council consisting of several Lore Masters—the Warrior, Cleric, Wizard and Rogue. Each of these Lore Masters has a deck of Lore cards that can unleash powerful effects on the field of battle. For example, the Wizard can create a magical portal that can teleport a unit across the battlefield; the Rogue can spring an ambush so your unit can attack first when attacked; the Warrior can parry an attack, causing an opponent’s attack to be weakened, and the Cleric can make the very hills quake, damaging units on and around this terrain! Players power all of these effects by spending Lore counters, which they receive during the game when they roll the Lore symbol on their Battle dice. The BattleLore core set was chock-full of plastic armies—human, dwarf and goblin—but it wasn’t long before the expansions began to roll out. The first was Call to Arms, an unique army-building system that used card decks instead of points. This was followed by army packs that expanded the options available to Dwarf and Goblin armies, including Goblin ostrich riders and Dwarven bagpipers. For those players that preferred to play the game without the Lore rules and concentrate on historical scenarios of the Hundred Years’ War period, the Crossbows and Polearms set was a must-buy. The Epic expansion provided rules for playing on double-sized battlefields with larger armies and extra Command card options, and is believed by many to be the best way to experience the game’s full potential. With the transfer of BattleLore to FFG, two new sets—Creatures and Dragons—gave BattleLore players more creatures to rampage over their battlefields, including a Hydra with interchangeable heads, and of course that essential fantasy staple, Dragons. So what’s the future of BattleLore at FFG? Well, they turned their attention to Battles of Westeros, a BattleLore-inspired game that recreates warfare in George R.R. Martin’s fantasy world from his A Song of Ice and Fire series of novels. It seems BattleLore became a brand name; and although BattleLore players were disappointed by the lack of further development of their game, it doesn’t change the fact that the game and its supplements still remains fun and engaging and a valued part of any gamer’s collection. Whatever its future, there is already a huge wealth of BattleLore goodies out there that can provide thousands of hours of exciting wargaming enjoyment. An egregious error! Fixed with thanks. Cute cat. Hi, are you going to do Battlelore second edition? No plans at the moment. After spending 4 years running battleloremaster.com, and playing this game, Memoir ’44, Command & Colors, and Battles of Westeros, I’m kinda tired of forking out cash for variations of the same system, to be brutally honest. Sorry! Did anyone ever come out with a point system for army purchasing in Battlelore? For having spontaneous draft battles and such. Not that I know of. You could check out the (now closed) forums on my old BattleLore site http://www.battleloremaster.com, or try Boardgamegeek. But it lacks the terrain tiles from the Heroes expansion: Command Tents, Witch Hut, Graveyard. Hmm, I’ll get around to adding those when I have the time. I had to reformat the whole page but those bits are added. That’s it for original BattleLore!